I hope all of you have been enjoying Reel Marketing this week. We really appreciate the work our guest vloggers put forth to make this great. 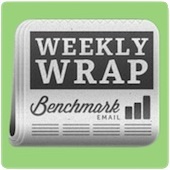 Have you subscribed to the Benchmark Email YouTube channel yet? Doing so enters you for a chance to win a GoPro HD Hero video camera. How to Price Your New Product? How about Free? While pondering possible jokes and trying not to perpetuate stereotypes about my people, I kept repeating “free” in my head over and over. Cue me singing through the entire “Free Bird” guitar solo in my head. Welcome to the inner workings of my brain. That odd tangent aside, do you know How to Price Your New Product? How about Free? If I don’t tell you this now, people may never know. My favorite title suggestions for our video blogging series were “You too, YouTube” and “Vlog is Not a Dirty Word.” They still crack me up. Alas, Reel Marketing was a far better call. Check out Benchmark’s Reel Marketing Series & GoPro HD Camera Giveaway. Seriously though, that cat has been a favorite of Benchmark Email HQ ever since Jasmine first turned her video in. Don’t miss the first entry to Reel Marketing: Vlogging Composition, Lighting and a Cat. Hey crowds...you wanna write the rest of this Weekly Wrap for me? OK. Next time. Maybe in The Future of Marketing: Trends in Crowdsourcing. That’s ‘cause the party is in the back! Mullet jokes, FTW. See how LinkedIn’s Business-Only Network Becomes Wall Street’s Darling. I am a champion excuse maker. I would be a starter on the All Star team. However, Joe comes in and strikes down every excuse in the book on why not to start a video blog. Now what? Find out why you should get started now in this edition of Reel Marketing: Overcoming Vlog Doubts, Part 1. I wish that when an ESP heard news like this, it looked like the room of a NCAA basketball team awaiting their fate in the NCAA tournament. It wasn’t. Still, it’s good to hear that the DMA Confirms: Email Marketing Budgets Set to Skyrocket. I really wanted this post to be about Pop-Up Video on VH1. It wasn’t. However, it is worth noting that the Pop-Up Trend Reshapes the Marketing Landscape. You guys, I just got the drawing attention joke that Pierce intended in this headline. This guest vlogger is a visual effects artist. That’s what he does! I’m gonna go nap, while you peep this installment of Reel Marketing: Branding Your Video & Drawing Attention. New Feature: 6 New Benchmark Email Video Tutorials!